Neville is an independent historian, undertaking a major history project - “Mapping Brisbane History”, to date, primarily funded by Brisbane City Council. 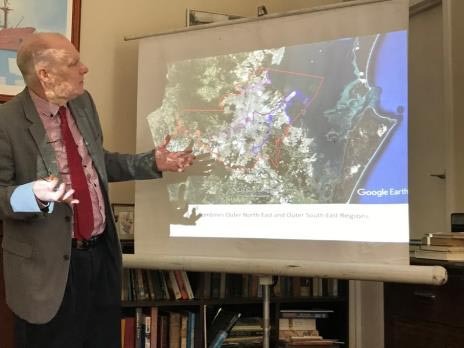 Neville has been working with many local historical societies spread across Brisbane City, as part of the process of combining the locational aspects of various historical sites spread across Brisbane with modern day digital mapping. His presentation to the Map Group focussed on the mapping aspects of the total project. In summary, his Presentation made it clear that a huge amount of geographical/historical knowledge and technical digital mapping/website design work and effort is undertaken to create the website Mapping Brisbane History Such ‘background work’ then makes it quite easy for the website user to click on an identified historic site located within an identified local area, leading to a side panel of information (up to 200 words) coming onto the webpage screen describing the historic site and what it is about. Neville advised Map Group that most local historical societies work at the district level and it is difficult for them to think and operate at a higher level, such as regional. Whereas, the starting point of the mapping process for the website had to begin at the regional level across Metropolitan Brisbane. The boundaries of these initial ‘mapping units’ were influenced by the historic sequence of development of the settlements which now make up Brisbane. These settlements generally followed the creeks located to the north and south of the Brisbane River, versus the more traditional view of the “North/South divide” of Brisbane along the River. This more geographic process generated 11 regions within Metropolitan Brisbane. The development of regions took different directions in settlements and urbanisation, which also enables the imaging of the boundaries of each region. For an example, the South-Central region generally started from the north and headed south, and followed the arterial pathways towards Ipswich and Beaudesert, between the Oxley and Norman creek catchments. The next significant mapping phase was the generation of Local Study Areas (LSAs), which synchronised the “mapping of history” with the spatial views where a historical district is considered much more in relation to its neighbouring areas. This is an unusual view to that which is held by most local historical societies. The argument is that history of settlements and the social interaction across Brisbane does not match the local historical societies’ narrower and the more modern concept of historical districts. The evidence can be seen in how the history of settlement, spread out the over four broad periods or epochs of history within Brisbane: being early 19th century; late 19th century; early 20th century; and late 20th century. This is important to the identification of historic sites. The process created 66 LSAs across Metropolitan Brisbane and the local historical societies extensively engaged in the project providing their knowledge of local historic sites within the LSAs associated with their district. The historic sites cover a wide range of activities, based upon the social and cultural elements of the people who lived within the landscapes of these LSAs. The sites include heritage buildings, schools, community halls, churches, and a wide range of other historic features of a local community. Bob Abnett, Coordinator, Map Group. The nursery manager Sharon and her volunteer staff propagate native seeds from the local area for sale. Sharon’s knowledge and experience were demonstrated as we followed a seed from the refrigerator to the seed box, following germination, into tube stock. The plant is “hardened” ready for sale by moving the plant from heavy shade to direct sunlight over an extended period. HANDY HINT: plant a seed to the depth of the seed size for germination. I encourage members to support their local Land Care Nursery (volunteer organisation); their plants are native to the area and raised in the local environment. Tanya, the Biodiversity Officer, produces the Jewel and Madeira Vine Beetles for sale to local councils and private landlords as a biological control of the Cats Claw Creeper and Madeira Vine. Tanya explained the importance of monitoring the progress of the Jewel and Madeira Vine beetles as they control the growth of the Cats Claw Creeper and Madeira Vine but do not destroy them. The nursery is on the site of the quarry and the available land has been revegetated, the trees and shrubs providing onsite seeds for the nursery. Mooloolah River LC Nursery: 2670 Steve Irwin Way, Glenview. Osprey House Environmental Centre is set among the mangroves lining the banks of the Pine River just North of Brisbane. Society members had a very enjoyable and informative visit to this centre. We arrived at 11.30am and were met by the volunteers who invited us to have our picnic lunch on the shaded veranda. After lunch, the experienced bird photographer, Pip, took us for a walk through the Marine couch pastures to the saltmarsh flats where we observed many water birds and were thrilled to see two swans nesting. We then leisurely walked along the board walk through the Grey Mangrove forest (Avicennia marina) and also identified the Stilted Mangrove species (Rhizophora stylosa). At the end of the walk there was a bird hide where we looked out at the mudflats and saw many local waders and seabirds. However, many of the migratory birds had already left for the Northern Hemisphere. We saw the Raptor Pole with its camera installed above the platform; even though it was not in residence, we were able to view video footage on a monitor located in Osprey House. Audrey had picked the perfect time for low tide at 1pm and Pip was a wonderful guide. She was so giving of her expert knowledge of the birds. It was such a peaceful location looking out at the intertidal zone of the Dohles Rocks foreshore and the Pine River. We left at 3pm thinking it would be a great place to revisit. Twenty eight people participated in this day activity. It was an early start, 7am due to daylight saving in NSW. Everyone was on time for the bus which made two pick-ups. One at Park Ave, Eagle Junction, the other at Nathan Park and Ride. On arriving at Madura tea estate, we were guided to a garden and then on a tour of the factory: the estate covers 50 acres with 250,000 tea bushes. The tea plant is Camelia Sinensis with two varieties cultivated on the estate: the darker, Chinese, and the lighter, Indian. Michael Grant Cook started the estate back in 1978 and today there are 9 gardens. It is a suitable subtropical location with 1700mm of rainfall, gentle slope and acidic soil. There are solar panels for power supply, three dams, no irrigation or pesticides used. About 55 locals work at the plantation. Tea production is a four-year process: April – May, the seed pods are collected and from these the seedlings are grown to 30cm then planted into the gardens. They grow for three years before harvest. The leaves are picked by a harvester every 12 -14 days between October - June. The leaves are delivered to the factory by truck and trailer. Each year, 500 bushes are replaced. There are three kinds of tea: white, green and black. Once the leaves arrive at the factory, they are dried for green tea and oxidized and dried for black tea. In 2002 machines were imported from Italy to produce 446 tea bags per minute. Teas are blended with other varieties from Indonesia, PNG and Sri Lanka for flavour. Lunch was at Tropical Fruit World where we had an alternate drop meal with their tropical fruit punch. It was a truly delightful location. After lunch we met with Tim Zwemer, who hosted us around Robert Quirk’s sugar cane farm. He showed us ‘before’ and ‘after’ photos of the farm to showcase the new farming methods. They have trialled methods of applying fertilizer to the root and leaves to minimize the run off and prevent fish kills. Also, they have increased the yields per hectare. The Condong mill and farm have been accredited with the Bonsucro label which is the global standard for sustainable sugarcane production. It is awarded on environmental and social criteria. We were fortunate that the rain held off till we were back in the bus. We left at 3pm as planned and were home on time. All told it was a very interesting, informative and enjoyable day. By Jeanette Lamont, trip Coordinator.